If you've been following the blog for any length of time you are well aware that I believe the markets disconnected from economic reality for good in the middle of 2013. The past 3 years have seen consistent growth in asset prices while economic activity has sputtered from Asia to Europe to the US. However, today may have finally been the day that broke the camel's back. For no real reason, the market continues to levitate higher on hope and dreams that an individual who has failed repeatedly is going to somehow, magically jump-start growth for every company in America (side note - I'm admittedly biased - my first job involved restructuring some Trump debt after one of his bankruptcies and I felt like I had to take a shower after every interaction with his company. They were shady, incompetent, demanding, and argumentative at every point of the negotiation and it was the catalyst that got me out of commercial banking). The grandest irony of this latest market rally is that while both Sen. Bernie Sanders and President-Elect Trump roundly criticized Sec. Clinton for her connection to Wall Street Banks it's the banks are driving this rally. The incredibly influential roles being filled by current and former employees of Goldman Sachs both in leadership and behind the scenes has pushed the shares of Goldman up 30% in a MONTH adding $20 billion to their market cap. Goldman Sachs alone accounts for roughly 1/3rd of the 1300 point move in the Dow Jones Industrial Average since the election. So, I guess it's less about draining the swamp and more about filling the swamp with guys who drive cars that are worth more than your house. If you add in JP Morgan Chase and Caterpillar more than 1/2 of the gain of the Dow is attributable to just those 3 companies. So here we go again on the subject of computerized trading. Today, the markets were up, but nothing was out of the ordinary until someone decided to pull some of the liquidity from the market. The best way to think of this is to say that it's like going to the grocery store for bread and when you get there they take 100 loaves off the shelf and only leave 3 loaves on the shelf. Well, those loaves will suddenly go up in price if 100 people rush to buy bread. That is essentially, what happened today, the market dried up for some unknown reason at 1:31pm and sensing that the market could be easily moved, a computer bid for $3 billion worth of futures in 1 second. This is by far the largest trade I've seen in recent memory. Again, thinking about our bread analogy, there were very few stocks for sale and a MASSIVE order hit the market as that exact moment conveniently causing panic buying and rising prices. This spurred more automated buying and it was off to the races. Think what was happening in the mid-1940's: we were emerging from the Great Depression, fighting WWII, and we were about to experience the greatest period of innovation and growth in our nation's history. If Trump's spending plans are real it is very likely our debt to GDP will exceed the highest levels experienced since the end of WWII and the ramifications of that for everything from the dollar to interest rates is significant. The key quote in there is often ignored by the financial media that want you to think the stock market is still that big marble building in lower Manhattan. 100 companies with 5,000 servers control 90%----90%!!! !--- of the Nasdaq market. The total value of US corporations has now exceeded the dotcom bubble. I can't get this chart due to copyright restrictions, but it shows the value of all stock and debt of US companies and the run over the last month has now pushed us into uncharted territory. This is very telling - the US 10 year note (that has been rising in yield) is currently yielding 0.5% LESS than it was in March of 2009 --- the absolute bottom of the financial crisis. I can hear you all saying, "what??". Well, the yield on the 10 year note should go up as people believe the economy recovers and they stop seeking safe assets like US treasuries. So, at the bottom of the Great Recession the Dow hit 6,500 and the yield on the 10 year note was roughly 2.9%. Today, the yield is about 2.4%, indicating even greater fear and risk in the global economy today than in March of 2009, but the Dow is at 19,500. Finally, this is the overall chart of market psychology. 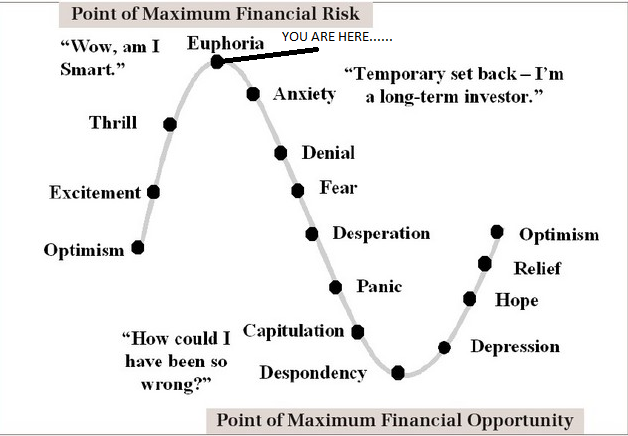 I believe we're nearing peak Euphoria (we can get sillier from here, see Feb/Mar 2000 for reference), but I think by January we could be in the Denial phase. Just a note to wish you a happy new year- and to tell you how happy I am that you continue this blog. I look forward to your insights in 2017.